We’ve been implementing digital citizenship across Eastern Shore School Board and have made our way into all of our schools. Most of the efforts were focused in elementary schools where we did a series of badges to learn about communication, safety, digital footprints, copyrights, and cyberbullying. 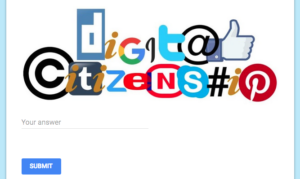 You can see the activities which go with these badges on the ESSB Digital Citizenship Board. With the next phase of our DC implementation, we plan to spend more time with older students in high schools. On one hand, it seems students are tired of hearing the same old stuff about online safety. On the other hand, we still receive comments and concerns coming from our high school students regarding appropriate behavior on the web. We need to add a level of maturity to our elementary school badges so the message is not too juvenile for our high school audience. Who better to ask than the High School students themselves? New Carlisle High School Students recently presented recommendations to Commissioners and Directors, with ideas to stop bullying and cyberbullying. These students showed great insight by recognizing the importance of support for victims, but also support and education for the bully. It’s true. Many hurtful things posted online do not start out with mean intentions, they likely start as a joke. We need to educate everyone about the impact of posting online, including those who are bullying. We look forward to hear more from ESSB students, to help resolve cyberbullying challenges. So where do we start? Is there a difference between Bullying and Cyberbulllying? 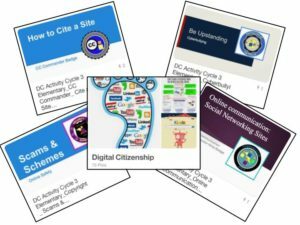 Citizenship and Digital Citizenship? Not really. We learn in our Language Arts classes the importance of considering our audience when we write. Sure, we may keep a journal for ourselves, but writing for an external audience requires some thought (and language editing). Each of us can occasionally make poor choices and say irresponsible things, adults included. In a public situation, we know that it’s not two-faced to edit what you say based on the audience we are speaking to. It is professional, honorable, and earns you respect. This, provided it is said with sincerity. An office clerk makes salted caramel cupcakes and serves them at a meeting, as a surprise for a colleague’s birthday. What a sweet gesture, right? Well, the colleague really doesn’t like the taste of caramel, and adding salt makes it even less appetizing. The colleague could take a bite and roll around on the floor gagging in front of everyone…. or they could consider the context and the audience. In the big picture, does it even matter that caramel is not their favorite? Are they lying when they say that they appreciate the gesture? Are they being two-faced because they focused on the kindness of the act, but not on taste preferences? I know the scenario may be oversimplified. The point is, courtesy expressed in person also needs to extend to online interactions. (BTW, circumstances were altered in this scenario to protect the true identity of the cupcakes. No salted caramel cupcakes were harmed). So, we know that the audience needs to be be considered. What if we don’t know who the audience is? Well, posting written comments or images online becomes even trickier because we never know who our potential audience will be. You and a couple of friends may know it’s just a joke, but what happens when your words get to somebody with a completely different interpretation? Will your grandmother read it? Could an impressionable elementary school child get their eyes on it? How about your future Boss? I know, we can say, “that’s their problem”. But it’s not! When you post something on the internet, you are saying it to everyone. It’s not called the World-Wide-Web for nothing! 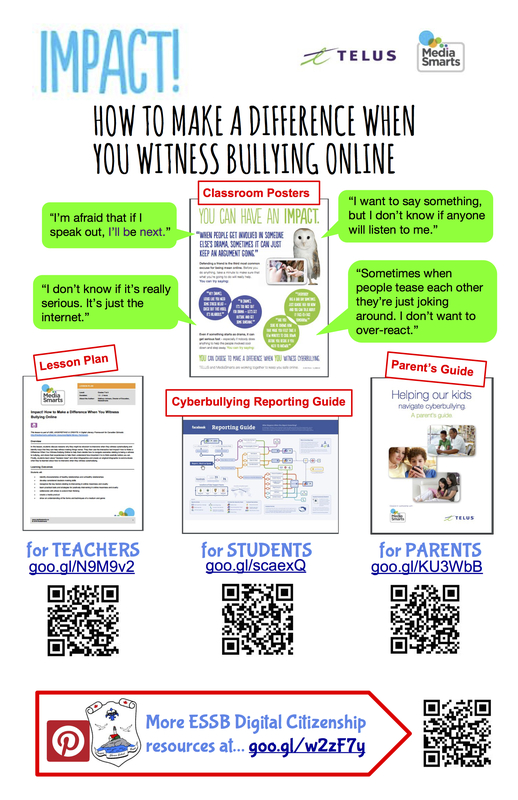 I stumbled on this idea from Media Smarts and I wonder what Students, Teachers and Parents think of this resource to help continue our conversation around Digital Citizenship. There are resources here for Students, Teachers and Parents. Please print the Poster and post it in your schools. Perhaps this can reinvigorate the topic and engage Students in the process to build on what has already been done. It’s a good place to start, but where do we go from here? 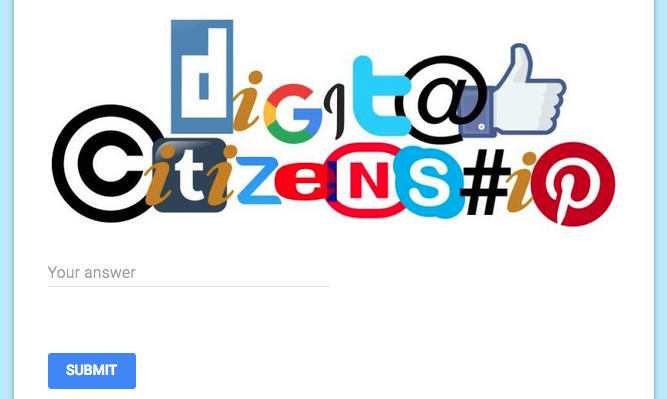 Do you know any useful resources to promote positive Digital Citizenship? 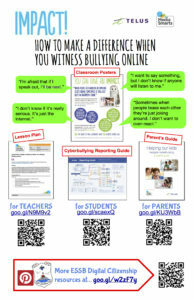 Have you seen any creative ways to counter Cyberbullying? Please share your ideas in this one-question survey. « Fit and Grit Recap with photos to share.